Save the planet. 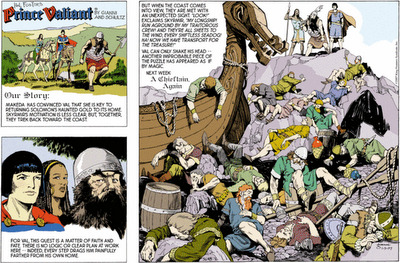 Stop reading Prince Valiant. A royal Ink and Paper waste extraordinaire. When I was a kid, it was my Sunday chore to fetch the bread, milk and papers. Today, the Sunday Papers represent a bastion of poor writing, tons of cell phones adverts and pointless infomercial type tat. I was in Hospital recently after a bad scooter crash. Its a pretty boring place, and I had the time to read literally everything. Like a child, I went straight to the cartoons. (only peeking at the back page with the bikini girl when nobody was looking) Now at 34 years old, Im growing older, but it dawned on me. Like Riaan Cruywagen, there is something that has been a constant in my life since childhood. Even since childhood, I cannot recall a single occasion where reading that cartoon made any a sense. It may as well be like me watching all the soap operas ever created with all their characters thrown in together. Who is this man, what is he fighting, who are the enemies, what is It about? WHEN WILL IT END? Is this the same for others I wonder? I asked some friends…Nobody ever read it. People talk of global warming, pollution and using our resources carefully. 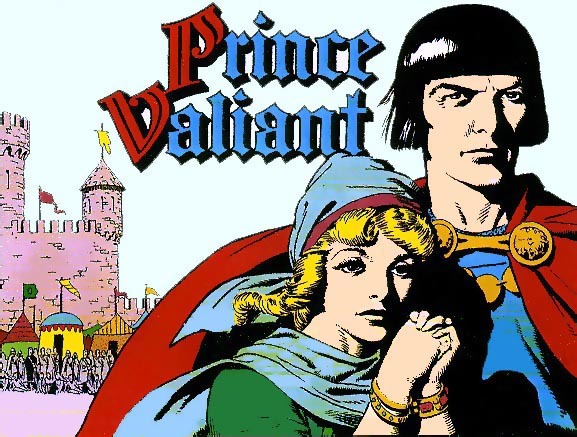 I figure that over the past 25 years, that the ink, paper, distribution, and general other such nonsense, has seen Prince Valiant about as carbon unfriendly as asbestos. It started to wonder. Perhaps, just perhaps, there is someone out there that has collected the comic section from the paper over the years. Not that I really care, but I would like just once, just once, to be able to flick through several years worth of Prince Valliant in one go. Just to get a simple idea about what is going on. If you can help, if you know anyone, who has a massive collection of the Sunday cartoons, Please get in touch with me. I don’t know what is driving me madder, my mangled leg, or my mental anguish trying to work this tedious story out. I tried when I was a kid but I could never work out what it was on about. It’s kinda like supastrikers. I can’t believe it’s still being published. Superstrikers is a commercial advert for Caltex and Visa and Spur. god knows why. I have a friend who does the colouring for it. Its at least paid for. Prince Valient has its history up there with the Da Vinci Code. More pointless than burst condoms….